The feeling was unfamiliar. Alone, I sat on the splintered wooden bench while the passersby sized me up with skeptical curiosity. Their skin glistened with sweat, accentuating the slash marks lacing both sides of their faces. The slash marks had been deliberately crafted into their visage, haunting me with wonder. Images of celestial snakes and sword-wielding gods decorated the decrepit dwellings surrounding me. This was a faraway world, and for the first time in as long as I could remember as a traveler, I felt the fear of the unknown begin to surge in my veins. I was in the center of Ouidah, the spiritual mecca of Vodun, immersed in the shadowy culture of voodoo lore. The slash marks were the results of ritual scarification, a tradition in which emblematic scars are etched into the skin as symbolic protection from evil spirits. To an uninitiated outsider like myself, the tattoo-like scars were a bone-chilling ritual from an ancient religion cloaked in mystery and misconceptions. Understanding its essence had become my travel Holy Grail, and I was willing to explore the depths of its holiest places to discover its truths. Voodoo exists today in the Americas as a syncretic belief set, producing evolutionary branches of the African religion in Louisiana, Brazil and Haiti. Its roots can be traced to the Gbe-speaking ethnic groups of West Africa, particularly the Fon people in modern day Benin. In fact, the term “voodoo” is derived from the Fon word “Vodun (Vodoun/Voudoun),” which translates to “spirit” in the local language. I wanted to see life through their perspective, and to discover the realities of their spiritual approach to life. A dance alongside the spirits and superstitions of Vodun lore inevitably began in Ouidah. As one of Africa’s largest slave trade trading ports during the 18th and 19th centuries, Ouidah prospered as an extension of the ruthless Dahomey Kingdom. Following the abolition of slavery and the collapse of Dahomey rule, Ouidah remained a spiritual epicenter for native African religions, specifically Vodun. Today Ouidah is home to a variety of mystical landmarks honoring its cultural past, such as the Temple of Pythons and the Sacred Forest of King Kpasse. Vodun is not a religion practiced casually; in this part of the world, Vodun is a way of life. The depth of Vodun spirituality is massive and variations exist within the different ethnic, regional and historical practices, but I’ll briefly explain the basics – as I can best understand them – for the sake of clarity. Vodun considers itself to be a monotheistic faith, whose primary creator goddess is called Mawu. The existence of a vast pantheon of lesser gods is recognized, each associated with natural forces in a similar structure to the religious pantheons of ancient Greece and ancient Egypt. These lesser gods interact with Mawu on behalf of the spirits on earth, whose relationship with the divine Supreme Being is akin to the heavenly saints and angels of Christianity. While practitioners of Vodun, known as Vodounci, recognize the entire Vodun pantheon, individuals usually focus their energies toward a select few of their favored deities. Some examples of prominent Vodun deities and the realms of their natural powers include Sakpata (earth/health), Heviosso (sky), Egou (metals/craftsmanship), Legba (masculinity/crossroads), and Dan (prosperity/communication). Each deity is associated with a signature dance and drumbeat, and veneration of the gods is expressed by dancing and drumming to these unique rhythms. Communication with the fetishes usually begins by waking up the spirits through offerings of gin and communal sips of sodabi—a traditional West African moonshine type of liquor made from fermented palm tree sap. Prayers are recited simultaneously accompanied by communication with the spirit world via cowry shells; the shells are rolled like dice and their landing positions are interpreted as direct messages from the Vodun spirits. 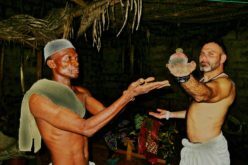 These spiritual consultations are orchestrated by a Vodun priest or priestess, referred to as a Vodounon, respectively, whose role is similar to a shaman. These mystical gurus play an important role in their communities for their healing powers and spiritual wisdom, providing insight on health, relationships, justice and the connections to the metaphysical world around them. The perspective boundaries separating “intensely spiritual” and “obsessively superstitious” can fade into gray at times, but Vodon pulsates with an undeniable reality that everything in life has meaning; every moment is alive. I had no formal plans beyond finding a seat on that bench that first day alone in Ouidah; I knew it would only be a matter of time before I was approached. I was playing dice with the universe choosing to traverse this continent without prior connections, but like most parts of the developing world, they tend to find you before you find them. Dressed in a traditional shirt and trousers, known as a Beninese bomba, Odjo walked toward me with a muscular gait and the confident swagger of a man in his physical prime. A local shop owner and proud father of two twin baby boys, Odjo sensed an opportunity. He spoke a decent amount of English – a rarity in that part of the world – and offered to show me around town in exchange for a small fee. The good fortune of connecting with an English-speaking local with a good pulse on the community cannot be understated; navigating rural Africa would have been impossible without someone like Odjo. I doubled down on his offer, asking Odjo to be my personal guide exploring Benin’s Vodun culture in exchange for a higher price tag. We both recognized the auspiciousness of our chance encounter, and we happily shook hands. Our friendship began in a spark of fortuity and intrigue. Odjo introduced me to countless Vodun priests and practitioners throughout Ouidah over the next several days. He acted as my guide and translator, mediating conversations between myself and the major players of the Vodun communities. I was less concerned with the dogmatic minutiae and more interested in understanding the overarching philosophies of Vodun. I was prepared to start each conversation with a simple two-part question: what is Vodun, and how could it be used to live a better life? The ethereal world of Vodun would welcome me with open arms. Agaja came from a village a few miles outside of Ouidah. He wore a traditional blue bomba accented with red and black patches and a cap above his head. His beaded necklaces hung low near his waist, swaying to the slow pace of his strut as he approached me with an ironclad demeanor, seemingly impervious to the highs of delight and the lows of fear. His calmness was contagious as he sat down on the wooden chair in front of me. I inquired about the similarities to the concept of karma, but he was unfamiliar with the term. His hands shot back and forth through the air as he spoke, like a conductor leading an orchestra in slow motion. I prodded Agaja with more questions about his subtle reference to the notion of reincarnation and Vodun’s concept of the cycle of life. I nicknamed Agaja the Voodoo Buddha, but neither he nor Odjo got the joke. We departed the village and headed further outside of Ouidah, seemingly treading farther back into time. A grotesque fetish featuring a pair of horns and a prominent phallus marked the entrance to Glele’s village. This was Legba, the trickster Vodun deity of the crossroads, and similar fetiches placed at the gateways of rural villages were ubiquitous throughout Benin. Glele was thickly built with broad shoulders, a bulging neck and the bald head of a battering-ram. He liked to wear a live python around his neck like a collar, though his intimidating guise was offset by a jovial demeanor and a hair-trigger smile. His home featured a large fetish dedicated to his patron deity Dan, the serpent god associated with communication to the spirit world and believed to endow its adherents with prosperity. 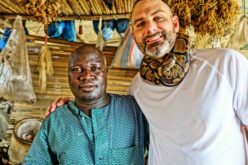 My admission was determined by his snake’s reaction to being placed on my shoulders; after Glele had laid its body against the back of my neck, the snake coiled around me until it silently found a position of comfort. I was allowed to proceed. “The snake alerts me to negative energy; but he seems to like you,” he chuckled as he prepared our shots of Sodabi. He handed me a cup, then took the snake from around my neck and placed it gently back around his. The concept of using Vodun as a weapon captivated me with curiosity, so I encouraged him to elaborate. He spoke of an ancient system of justice that predates the legal systems of the modern world. In a land which has historically lacked the luxuries of an effective criminal justice system, I could understand the practicality of Vodun justice. The more he spoke of Vodun, the more he appeared like a Jedi master elucidating on The Force from Star Wars. Glele put the snake back around my neck as I contemplated his words. The snake snuggled up in a comfortable position, and he proceeded with an unexpected question for me. I momentarily went blank, sensing the weight of karma and personal responsibility on my conscious similar to the way the snake had coiled itself around my neck. He paused for a moment, silently reflecting on his thoughts, looking at the snake wrapped around my neck. He rolled the cowry shells, mumbled something in an unfamiliar language, then turned back toward me. I took a break from Ouidah for a few days while Odjo returned to his business and family. In the meantime, I explored the side streets of Benin’s coastal highway when Tessi and I first crossed paths. He wore a collared orange and black shirt with shorts and sandals, striding with a hop to his step like he was jamming to a song playing inside his head. He spoke five different languages, including English, much to my delight, and conveyed an infectious friendliness that was rare in Benin. He took an interest in my Vodun curiosity upon our introduction, and he offered to help me along my journey simply for the sake of helping. Tessi was an old soul in a young man’s body. He liked to sit back with one foot resting over his knee, with a habit of extended pauses of contemplation before jolting upright with vigor as his stream of consciousness flowed into spoken words. Born of a Christian mother and Vodun father, Tessi was considered a Christian at birth. His original name was David. At the age of four, he fell seriously ill, falling into a coma for multiple days before being pronounced dead. It was at that moment that his aunt, a Vodun priestess, called on the spirit of his deceased grandfather to help bring him back to life. As the story goes, his grandfather reincarnated into David’s body, helping maintain his lifeforce, while his body began to heal. David miraculously survived with a full memory of the ordeal. Later, he formally converted to Vodun, choosing to be called Tessi as his native African name. His home had individual rooms for fetiches dedicated to Egou, the warrior god of metals and craftsmanship; Dan, the rainbow-colored snake god, who also served as the patron deity of his grandfather; and Sakpata, the god of the earth with associations to health and wellness. Tessi’s concept of Vodun was holistic and harmonious. His convictions were strong, and his energetic sense of spirit overflowed as he spoke. In his eyes, there was a sense of meaning to the occurrences of everyday life. I had to give him credit; in a land where corruption is rampant, opportunities are scarce and trust is rare, Tessi was overflowing with enthusiasm and integrity. But I needed more clarification on the nature of Vodun. Was it an abstract natural force, or did it have a deeper meaning? What was the underlying point of it all? Tessi had been born in a hut in a small African village, yet he possessed the wisdom of a thousand lifetimes. He called it “L’espirit d’afrique.” If he does not one day end up as a leader of his country, the world will be a lesser place for it. Tessi agreed to take me to a rural African market farther inland and far off the beaten path. We ventured out on his motorbike, following the bumpy dirt roads, which diverged into narrowing footpaths, to a primeval part of the world trapped in an ancient way of life. The cinderblock walls were decorated with images of an obscure crocodile god; the lone doorway was guarded by a white sheet of linen dancing against the breeze. Otherworldly chanting could be heard from within the the roofless structure. We parked the bike and began to explore, forgetting about the market at which we would never arrive. Tessi clapped his hands twice, upon which an elderly woman draped in a royal blue shawl appeared at the doorway. Other individuals in similar garb looked on from behind her, fixated on the unusual foreigner, who was clearly in a time and place that he did not belong. Tessi negotiated our entrance based on his Vodun connections, but not before I rid myself of my western attire and draped a white linen around my waist in a similar fashion to the others. They wore robes of white and royal blue with matching beaded necklaces. Silent feet bearing scars from a lifetime of shoeless labor poked out from under the robes. The tobossi-houe was dedicated to the spirit of a locally venerated crocodile deity (whose name I never knew). The chief Vodounon was identifiable by his flawless white tunic and a matching cap. He went by the name of Azangli. His presence was commanding, as he stood in silence with a penetrating, unshakable glare. Azangli lifted his arm in our direction pointing his finger at the ground. It was a signal for Tessi and me to kneel before entering. A woman knelt alongside us and rolled the cowry shells while she spoke to the spirit world. She tapped my shoulder to observe; the cowry shells indicated a positive sign from the Vodun gods. Azangli gave us a dubious nod, allowing us to proceed. The outer room hosted two life-sized crocodile figures, each dyed green with their jaws stretched open wide. The heads of the crocodiles were freshly covered in blood, remnants of a goat sacrifice from earlier that day. A wooden throne, shaped in the traditional design of the Dahomey kings, sat between them. Azangli had moved behind the entrance to the inner room, his piercing eyes tracing each of our steps with an apprehensive glare. The inner room was a sacred chamber featuring a stunning Vodun fetish unlike anything I had ever seen. A large rectangular altar was positioned in the middle of the room, roughly three feet high and maybe twice as wide. Layers of the skulls, skins, carved wooden objects, ornamented figures, offerings and other fetiche objects sloped like pyramid walls from its sides. Offerings of palm oil and bottles of gin lay close by. Atop the altar sat six crocodile heads; three life-sized carvings crafted from single blocks of wood, alongside three genuine crocodile skulls. Each of the crocodile jaws was open, with a large egg the size of a fist placed neatly at the end of its snout, between the upper and lower front two teeth. This was the rural community’s holiest of holy sites, their sacred Vodun cathedral, and we had unintentionally interrupted a moment of ritual worship that my eyes were never meant to have seen. Azangli pointed to the ground with the commanding presence of an emperor, and we quickly kneeled along with the other dozen or so Vodounons in front of the altar of crocodile skulls. He recited a prayer while our foreheads kissed the ground. The rest of the group remained silent. A silver-haired woman wearing only a blue shawl around her waist handed me the bottle of sodabi. She moved about with the aging grace of royalty, appearing to be the high priestess of the sect; the spiritual queen to Azangli’s king. Tessi and I each took two sips, the first for ourselves, and the second to be spit out directly at the foot of the skulls. She knelt before the altar and rolled the cowry shells to determine the fate of our visit. Azangli sat on his throne in silence while he anticipated the message of the gods. She gave him a nod while she recited a prayer of gratitude in the Fon language. He returned the nod in our direction, speaking directly to us for the first time. “You have no negative energy, and the Vodun spirits have welcomed you,” he said in a sonorous voice that echoed with a charismatic gravitas fit for a king. I was overcome with a mix of euphoria and relief. I looked back at Tessi to see his face lit up with a confident “I told you so” shine in his eye. Azangli’s question was literal, and he expected a precise answer. The Vodounons stared back at me in silent curiosity as soldiers of Azangli’s spiritual realm. For a moment in time, all energies possessed by the Vodounons in the tobossi-houe would be focused on the subject of my request. That my wish would be granted was taken as an absolute certainty. It was the law of attraction; ask and you shall receive. Azangli sensed my ignorance, switching roles from monarchical sorcerer to Jedi philosopher; he was the human incarnate of Yoda crossed with Professor X.
Vodun manifests itself like esoteric magnetism; it rewards humility and punishes hubris. Pay it forward, show gratitude, and the positive energies of Vodun would guide me to prosperity. Act selfishly or wish harm to others, and I would be punished to the identical degree. The Vodounons circled around the room and knelt before Azangli, their hands held together solidifying an impenetrable ring around the altar. I knelt alone at the foot of the crocodile skulls with Azangli directly to my side. He sat on his throne and bellowed a prayer to the spirit world while the high priestess showered the crocodile altar with offerings of gin and palm oil. The Vodounons were synchronized in rhythmic chanting in between deliberate pauses from Azangli. I kept my eyes tightly shut with my forehead buried in the dirt floor, internally balancing the flooding sensations of gratitude and awe. I tried to breathe slowly and soak in vitality of the moment. Time and space stood still as my ego momentarily vanished, only to return instantaneously with the unmistakable feeling of deja vu. I raised my head to wipe the dirt from my face. The high priestess handed me a communal cup of sodabi, formally ending the ceremony. Azangli granted me a silent nod of approval while I stood on my knees, eye to eye with the jaws of a crocodile skull. I was offered a bowl of cassava and goat innards, and I politely chewed away at the rubbery flesh. Azangli appreciated my efforts, finally cracking a smile. He offered me a single photo upon my exit, a solo portrait of himself on his throne. Then Tessi and I began our slow journey back towards the modern world. Odjo had been awaiting my return to Ouidah. He had arranged for me to meet a highly revered Vodounon, assuring me that all of my questions about Vodun would be answered. Zomadonou’s home was located down a dirt road extending inland from the outskirts of town. He was tall with a sinewy frame and gumby-like arms and legs, topped by a white cap similar to a Muslim taqiyah. He moved about with bolts of energy from the base of his spine, constantly veering in roundabout directions as his attention shuffled between thoughts like a mad scientist. He welcomed Odjo and me with a toothy smile and a handful of cowry shells; a few rolls of the shells eliminated any further hesitations: Odjo and I were meant to be there. I asked about the similarity to Yin and Yang, but was met with a blank stare. The abstract philosophy was enchanting, but I wanted to understand its practical application. This prehistoric animistic religion sounded remarkably like new age philosophy. I began to wonder if humanity’s approach to spirituality was coming full circle from the time of the ancients. I wanted to know more. Could an outsider like myself harness the powers of Vodun? “Vodun… You cannot touch it… Like light, it has no shape…” His hands maneuvered through the air as if he were sculpting his thoughts from an unseen block of clay. The emphasis on the connection with the energies of the universe was evident, the role of positivity undeniable. But, the stigma of malicious evil spirits remained. The ritual scarification only seemed to intensify this fear, and I could not understand its practicality. I began to point to the scars and ask, but Zomadonou remained one step ahead. I wasn’t sure exactly what that meant… But how could I say no? I looked at Odjo, who gave me a nod; I returned the nod to Zomadonou. I could feel the universe laughing at me once again. I had wanted to learn about Vodun from the perspective of its most spiritual adherents, and here I was, in the back alleys of Ouidah, with the opportunity to have a powerful Vodun priest perform a ritual ceremony to conquer evil energy and reveal the Vodun powers of my own inner spirit. I wore a white linen cloth over my teal Beninese trousers, no shoes or shirts allowed. The outdoor courtyard behind Zomadonou’s home featured conglomeration of peculiar fetiches laid out on a mat. The fetishes were covered in a messy blend of dust and dried blood. Their specific purpose remained unknown. Zomadonou and I knelt in front of the fetish while he rolled the cowry shells and recited a prayer. Odjo and other locals had gathered around us as spectators, their eyes dancing with fervor at the site of a foreigner, who they began referring to as their brother. A young girl handed Zomadonou two live chickens. He held the chickens upside down, as if their legs were handles. A groundswell of fear consumed me once again; suddenly I knew what was coming. I had yet to witness ritual sacrifice as part of a Vodun ceremony, and I had never ever expected to be an active participant. The feeling was unnerving, but I had to respect the cultural norms; I was a guest in his home, and they were not my rules to reform. I looked into the chicken’s eyes and apologized from within. Zomadonou traced the chickens over my body like a metal detecting wand, reciting a prayer in the Fon language throughout the process. Using a sanctified knife designated strictly for ritual sacrifice, he cut their throats one at a time and dripped the blood over the fetish in absolute silence. It is during these moments that the Vodun spirits manifest on earth, deriving strength from the blood of the sacrifice, and performing the divine miracles of Vodun lore. In my case, that meant a spiritual cleanse of evil and negative energy, with the hope that my so-called Vodun powers would become actualized. Zomadonou again began to speak aloud to the spirits, while the chickens ceased to suffer. The next step was a purification bath. Across the courtyard was a barrel filled with sanctified water and freshly gathered plants, whose mixture had been specifically formulated for my individual ceremony. I was instructed to drench myself completely in holy water using the vines that had been soaked inside the barrel. It was a cleansing in the most literal sense, and I was given privacy behind a white curtain hanging from clothesline in the courtyard. I returned to the fetish mat and slowly took a seat on a stool placed near a circle drawn from flammable black powder. Zomadonou crouched next to me and placed a cup of dark powder on the ground. He opened the palm of his hand to reveal an unopened razor. Zomadonou slowly unwrapped the razor’s packaging while giving me a nod. My jaw clenched; I was petrified. My voice failed as my hand defensively shielded my face. Ritual scarification on my face was a line I would not cross. Zomadonou laughed at my trepidation and turned his attention to the village children, who looked on as eager spectators just a few yards away. “We no longer cut our faces; look at the children,” he said in a confident tone. It was something I had missed entirely. The faces of the children were clear and unblemished. “Now we make the cuts very small… around the body,” he said as he waved his hand in a circular motion to my chest and shoulders. I stared at the razor blade as my heart began to pound with the intensity of an African bongo drum. I took a deep breath and accepted the unknown outcome of my fate… there would be no going back. He cut me twelve times; six pairs of small incisions on both shoulders, both sides of my torso, my chest and my back. The small slash marks were painless, the trails of blood minimal. Zomadonou quickly rubbed the chalky mixture of soot-like powder deep into the open wounds, chanting to the gods. The powder instantly transformed the cuts into tattoos, solidifying their permanence and enhancing the visceral effects of scarification. We broke from the formality of the festivities to share an evening meal with the local community. The growing darkness of night consumed Ouidah as we broke bread together. We returned to the outdoor courtyard and immediately consulted with the spirits. Situated before us was a fetish sack crowned with the heart of a chicken and soaked in scented oils and sacrificial blood. I positioned myself directly inside the flammable black circle while Zomadonou called out to Sogbho, a potent sky god of the Vodun pantheon associated with the power of explosives. I cradled the fetish sack in my hand and balanced the chicken heart on the surface. I extended my arm outward toward the stars. Zomadonou put a match to the base of the circle, its outer edge igniting in both directions. He shouted at the nighttime sky as I held the fetiish steady with the focus of a sniper. The onlookers were spellbound by the blazing circle of firecracker powder and booming Vodun oratory. Zomadonou’s arms thrashed through the smoke and shadows like an inflatable tubular air dancer, enhancing his grandiloquence in a cinematic fashion. The fire burned out as Zomadonou’s words tapered off. The fetish remained steady; the heart did not fall. The audience roared with approval. Zomadonou confirmed that Sogbho triumphantly cleansed all negative energies and evil spirits from within me. He took the fetish from my hand and led me into a shadowy crypt-like chamber at the far end of the courtyard for one final task. He lit the chamber with scented candles, illuminating the carved wooden figures of Vodun gods and the sacrificial offerings of past ceremonies. We knelt before a small altar positioned against the center of the far wall. Zomadonou tactically moved the candles and fetishes along the edge alter. He rolled the cowry shells, crooning with the spirits one last time. He handed me a cup filled with dark powder, mixed it with soda, and instructed me to drink it all. I had never come across any information regarding this type of ritual during my pre-trip research, and thoughts of its potentially harmful effects swirled through my head. When I asked what it was, the only answer I could get was “Vodun drink… so the Vodun stays with you.” He pointed to his gut before extending his finger in a circular wave around his body. I wrapped both hands around the cup, held it to my lips and contemplated my fate. This was uncharted territory. The Holy Grail scene from Indiana Jones and the Last Crusade flashed in my mind; his quest for knowledge of the divine had taken him through the depths of legends, until he held the cup of Christ in the palms of his hands. The stakes were a far cry from the fate of mankind, but nevertheless my moment had come. I had asked for knowledge of Vodun, and the final challenge now similarly rested within my own two hands. The allure of this ancient knowledge was irresistible. I took a deep breath as I took one last look around the room, the shadows of Zomadonou and the fetish statues waved in the flickering candlelight of the crypt-like room. I shut my eyes, tilted the bottom of the cup to the pitch black ceiling, and let the Vodun drink flow inside me until every last drop was gone. It was surprisingly smooth, and it tasted like candy. I gradually opened my eyes, letting it all settle, slowly breathing in the tranquil fragrance of the scented candles. I looked around the room, momentarily fixated on the reflections of light dancing against the scars and the smile adorning Zomadonou’s face. My own smile reflected his, and we started to laugh alongside each other. My hands no longer trembled. The muscles around my neck loosened up. The tightness in my back relaxed. The fear that had consumed me since that first moment in Ouidah began to melt away, until it evaporated completely. I was quickly seduced by a feeling of illumination, swept up in a profound moment of clarity. The concept of evil was symbolic; the evil spirits had been a metaphor for fear. The scarification served as an esoteric vaccination against the destructive malaise of fear. The ring of fire signified its metaphysical crematorium, symbolically incinerating the clutches of fear in a grandiose public execution. The ritual cleansing was a metaphorical polishing of our inner shine. Fear, particularly fear of “the other,” has divided humanity since the beginning. Fear prevents us from connecting. The evil spirits that have plagued the unity of the human race were never an external force to be battled with swords and superstitions; they were a force from within, an individual blemish on the universal consciousness of the human spirit. United we stand. Divided we fall. It all became perfectly clear. Zomadonou’s sacred chamber turned to complete darkness as he blew the candles out, but only then could I finally see the light. Vodun is a dazzling expression of ancient mysticism and new age spirituality, which sees all life in the universe as a connected natural force. It is Buddhist karma crossed with The Force from Star Wars; an impartial power of the Law of Attraction traveling a circular path through the cycle of life. It is the prehistoric science of the natural world; a polytheistic system of divinity, reason, and justice; an omniscient answer to the mysteries of life. It is the sound of music; the harmonious vibrations that flow from the rhythms of our mind. It is the spiritual companion, the Yin to the Yang, of the life giving energy of the sun. It is the universal divine spirit, known by many different names in many different cultures across the globe and throughout history; whatever you want to call it is ultimately up to you. 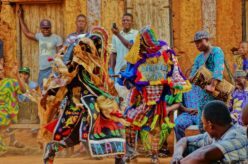 I had one final question for Zomadonou about the nature of my soul and the spirit of Vodun; I had been exposed to so much on this crusade, and I was trying to sort it all out. He sprang up from his seat in a eureka kind of moment, put both hands on my shoulders, and flashed his omniscient grin. Looking me straight in the eye, he began to answer. I should have seen it coming. Kevin Dimetres currently works as an educator and freelance writer in the Washington, D.C. area. His stories have been published in Travelers’ Tales, Immersion Travel Magazine, GoNOMAD, Transitions Abroad, InTravel Magazine, and the Washington Post. A collection of his work can be found on KAtaraxia.com.